His Holiness Sri Ganapati Sachchidananda Swamiji is a mystic composer and musician of rare spiritual insight and depth. Through his music which has essentially the spiritual base, he is propagating the healing meditative and therapeutic value of music. Having written thousand of compositions in several Indian languages and English, He is adept on several musical instruments. 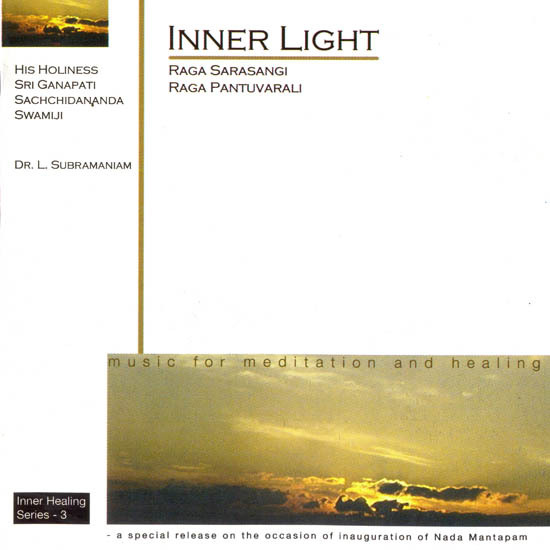 During concerts, Sri Swami plays synthesizer, as on this disc. By listening to His music on compact discs, Cassettes or live concert, one grasp the energy and impact of His music. In fact Sri Swamiji music has been hailed as Music of the spheres the music not only touches the soul, but also lifts it to the higher planes of consciousness. In India people participate in tens of thousands in number at his concerts. Sri Swamiji is also very well known, and His music is duly acknowledged by the purists of Indian classical music. His delicate, impeccable and profound composition are traditional, using unheard of patterns that have given a new dimension to classical music. Music is only facet of Sri Swamiji’s varied personality his active involvement in several social charitable, religious and educational activities in India have also been very well acknowledge. In this concert history music, L. Subramaniam is among the few of the world’s greatest musicians who have earned at international reputation of complete, unmatched integrity. “If there is any musician who has contributed towards the popularization of Carnatic (South Indian Classical) music in the west, it is he violinist L. Subramaniam” says a leading newspaper in the U.S.
His prodigious talent was evident at the early age of two, when he could repeat music phrasis that he heard his father, professor V Lakshminarayana, Sing. After initial training in vocal music and percussion he switched to the violin and took the musical world by storm when he gave his first violin performance at the tender age of six. While he was learning and performing music, he also completes his studies in Medical School and registered as a Medical practitioner. But his love for music was all consuming and he gave up Medicine for music. Since then he has taken this age-old rich tradition of music to places where it has never been heard before and also performed in prestigious venues like the Bolshoi Theatre The Lincoln centre, Royal Albert Hall and the Champs Elysees Theatre to name a few.